A prior use as prima facie evidence in a plea of nullity is frequently cumbersome — and was unsuccessful here. The prior use had allegedly occured already more than 10 years ago. The defendant did not provide a binding cease and desist declaration; preliminary injunctive relief was granted. It was not even made conditional on the payment of a security by the plaintiff since the defendant had repeatedly argued that the allegedly infringing machines were no longer marketed anyhow. Thus, the FPC did not anticipate that the measures may cause loss or damage to the defendant (Art. 264 CPC). Milk frothers are frequently litigated in Switzerland. You might perhaps recall the decisions “Milchschäumer“ and “Milchschäumer II“ a few years ago. The present case is apparently not related to the old ones, but again pertains to a milk frother. Fortunately, catchwords are not confusingly similar: This time, it’s a milk frother for cold milk (Kaltmilchschäumer). One of the plaintiffs is the patentee of both patents in suit, i.e. a Swiss patent and a European patent. The other plaintiff is a member of the same group of companies. However, the parties are anonymized in the decision. Nevertheless, from the wording of the requests and the technical details given in the decision, it is evident that CH 707 091 B1 and EP 2 120 656 B1 are the patents in suit. The patentee is Steiner AG Weggis. A connected undertaking of Steiner AG Weggis is Thermoplan AG — quite likely the second plaintiff. Never heard? 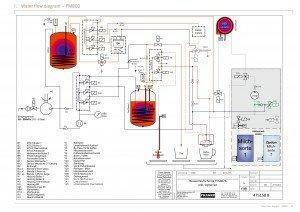 Thermoplan manufactures the machines that Bloomberg recently referred to as “Starbucks’ secret weapon“. Opposition/appeal proceedings are currently pending against EP 2 120 656 B1. The online file wrapper at the EPO is insightful: Franke Coffee Systems GmbH of Germany intervened as a party (under Art. 105 EPC), since proceedings for infringement of that patent had been instituted against them. In the intervention, it is referred to two summary proceedings at the regional court of Düsseldorf (Germany), i.e. 4a O 52/14 and 4a O 81/14 (the fulltext of the intervention is available here). No further details on these proceedings are available to date, but the present decision of the FPC also refers to two “corresponding decisions in summary proceedings” at the regional court of Düsseldorf on the German part the patent in suit. 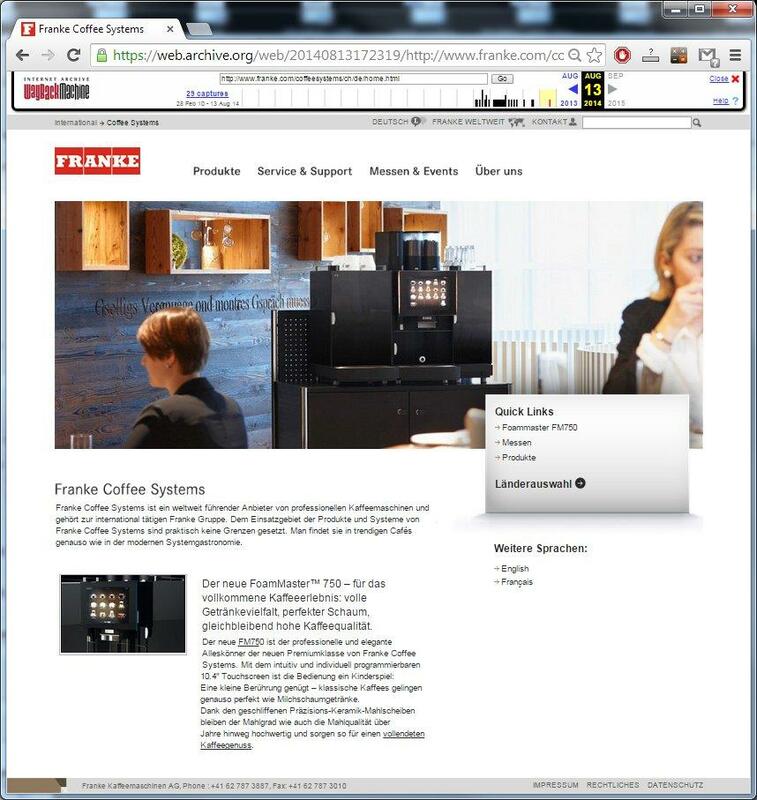 There are some further hints in the decision; in sum, it is abundantly clear to me that Franke Coffee Systems is involved as the defendant (i.e. 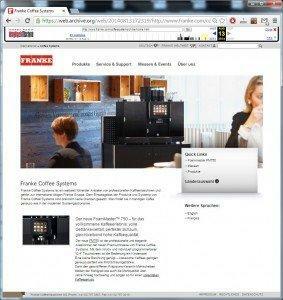 the Swiss member of the Franke group of companies, Franke Kaffeemaschinen AG). the milk or the milk/air mixture, which is sucked by the pump (1) und mixed with the air respectively the gas, is selectively conveyed via a throttle point (12) directly or via a flow heater (16) to the outlet (11′). 2. An apparatus for implementing the method according to claim 1, having a pump (1) sucking the milk from a container (3, 3′) via a suction line (2), having an outlet line (10) leading from the pump (1) to an outlet (11′), having an air supply line (5) opening out into the suction line (2), characterised in that the outlet line (10) has two parallel sections (10a, 10b), which can be enabled selectively by means of a valve (15) between the throttle point (12) and the outlet (11′), a flow heater (16) being assigned to one of these outlet line sections. Moreover, the request did not reach beyond the scope of the patents. Consequently, the FPC held that the wording of the requests was formally allowable. Construction of the term “throttle point (12)” was under dispute. Clearly, this throttle point converts the milk/air mixture to a milk foam. In a function-oriented construction of the term, the FPC first clarified the terms “milk/air mixture” and “milk foam”. There is neither a precise definition in the patents nor have the parties provided any commonly accepted definition. 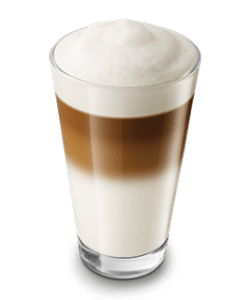 A Ph.D. thesis of Katja BORCHERDING was not held sufficient since it only relied on a single reference for an amount of 0.5-0.97 vol.% of air in a milk foam. The term “milk/air mixture” was thus construed very broadly as “any mixture of air and milk”, thus also encompassing “milk foam”. As to the contribution of the throttle point, the FPC held that this is any kind of bottleneck that at least contributes to the formation of a milk foam. iv) ALLEGEDLY INFRINGING EMBODIMENT NO LONGER IN USE, PRELIMINARY INJUNCTION ISSUED ANYHOW: HOW COMES? The defendant argued that the allegedly infringing machine had only been produced and sold from January 2013 to February 2014. It had then been replaced by a new machine with a different (allegedly non-infringing) milk frother. However, the defendant did not provide any arguments as to why the contested embodiment would not infringe the patents in suit. The FPC considered the legitimate interest of the plaintiff ex officio (Art. 59 CPC). A danger of repetition of the alleged and undisputed infrigement remained since the defendant did not declare to cease and desist; cf. BGE 124 III 72, r. 2a and BGE 128 III 96, r. 2e. Moreover, validity of the patents was still disputed, and even the allegedly non-infringing machine was illustrated with a diagram that still carried the name of the contested device. In sum, the FPC held that the legitimate interest in preliminary injunctive relief still remained. A threat of a not easily reparable harm was acknowledged for the reason alone that it would be difficult for the plaintiff to later on prove the causality of the harm to have occured from the infringement. Urgency of the matter was not compromised by the fact that the plaintiff had awaited the outcome of the decision of the OD of the EPO; this was rather appreciated as prudent by the FPC. Note that the prior use had occured already more than ten years ago. Two affidavits in support of the prior use and the technical details thereof were put on file by the defendant when the plaintiff had disputed the public availability and the relevant technical details of “Esprè Magic”. These affidavits were not supported with further documentary material. Moreover, the affidavits were not free from inconsistencies. Thus, the FPC was reluctant in considering these declarations. Apparently, the Regional Court of Düsseldorf came to the same conclusion in parallel proceedings in Germany. Moreover, it was not only that the FPC had doubts as to whether a prior use had actually occured or not. Even the technical details of the alleged prior use were held to be not sufficiently clarified by prima facie evidence to be considered novelty-destroying for the patents in suit. Novelty of claim 1 of CH 707 091 B1 over R4 (i.e. EP 0 485 350 A1) was disputed. The decision highlights two decisive issues: First, the term “throttle point (12)” was construed very broadly (cf. above), and thus the bottleneck in conduit 6 of R4 was identified as to fulfil this feature. Second, it was required that the milk foam be conveyed to the outlet in a cold state. R4 discloses that the conduits 3 and 6 can be held at room temperature, thus with inoperative heating elements 10. Accordingly, the FPC held that a prima facie lack of novelty of claim 1 of CH 707 091 B1 was given. To the contrary, it was held that no prima facie case of lack of novelty or inventive step of claims 1 and 2 of EP 2 120 656 B1 had been established. The FPC essentially followed the reasoning of the OD of the EPO in consideration of R4 and R6 (i.e. US 6,192,785 B1). The FPC could have made the interim measure conditional on the payment of security by the plaintiff, but (only) if it had been anticipated that the measures may cause loss or damage to the defendant (Art. 264 CPC). The defendant requested a security of CHF 2’000’000,–, but the FPC stressed that the defendant had repeatedly argued that the allegedly infringing machines are no longer marketed anyhow. Therefore, one would not anticipate that the preliminary injunction could cause loss or damage to the defendant. This illustration looks strikingly similar to the one reproduced on p. 6 of the decision, but details are scarcely visible in the decision. Pump P100 and restrictor BL0.8 are referred to in the decision, and are also visible on the right side of the above water flow diagram. 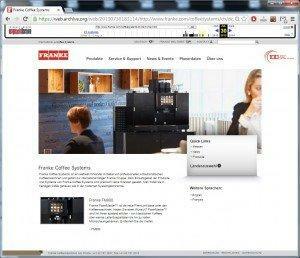 In my personal opinion, all these are strong technical indications towards the FM800 machine. In the meantime, the decision has become final. As can be concluded from the EPO file wrapper, the parties have settled their dispute.